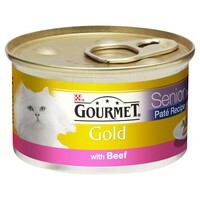 Gourmet Gold Pate Senior Cat Food (Beef) is a tender mousse containing beef that has been specially created to fulfil your older cat’s nutritional needs. Developed with a smooth texture that is easier to eat, the food provides key nutrients as well as protein and vitamin E to support your cat’s bones, joints, teeth and kidneys. Suitable for cats over 7 years of age.